The following comments about attractions in Wellington have been posted from individuals. We believe that the best reviews of Wellington, New Zealand are written by travellers and holiday makers who have experienced Wellington first hand and want to share their thoughts. Can you share yours? Please help us expand this section of our Wellington World Guide. Let us know what you think about the attractions in Wellington, New Zealand. Submit comments about Wellington attractions here. If you are a tourist and visiting Wellington, you really must go on the Cable Car and see some really incredible views. This Cable Car first came about over one hundred years ago and has probably been popular even since, it sure is these days anyway. They say that millions of tourists ride it every single year and I was one of them. It is bright red and hard to miss from Lambton Quay. The botanical gardens were nearby as well, and also the central business district. Oriental Bay is home to a really beautiful beach and even when the weather is a bit inclement, the beach is still lovely and very pretty, and very quiet. There are lots of different shells on the sand, so a lot to look at. On sunny days, it came be a bit crowded, but there is usually plenty of space really, especially if you are able to come here in the morning. Walking around Wellington - Go for a walk! By foot really is the best way to explore the centre of Wellington. This is a nice pathway around Oriental Bay, which leads right up to the Parade. We spent ages walking around the area, going on the beachfront, and shopping in the downtown area. There are guided walking tours available if you want to learn a bit more and make sure that you don't miss out on anything, but we didn't really feel it was necessary. 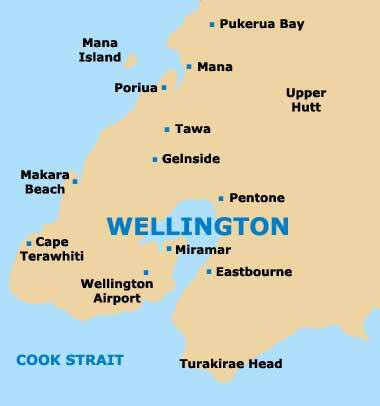 Please note that these Wellington, New Zealand comments and reviews are posted by individuals and are not necessarily the views of World Guides.